Warning! This margarita howls and bites back. Run with the big dogs by taking your margarita up a notch, or two! The Coyote Gold All Natural Jalapeño Margarita is handcrafted for those who enjoy spicy-hot food: A great compliment to Mexican cuisine, or any other favorite food. To obtain a perfect balance of Jalapeño taste and heat, we infuse Jalapeños in a margarita base made with the same all-natural ingredients used in our Original Coyote Gold All Natural Margarita. Then we taste the blend daily, ensuring the flawless blend of Jalapeño taste and heat has been achieved. Too hot? Try stirring in a little salt. Too tame? We want to hear from you! 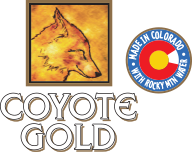 Give us a howl at customerservice@coyotegold.com. The Coyote Gold All Natural Jalapeño Margarita is available in 1.75L bottles. Ask for it at your favorite liquor store. A beach in a bottle! That’s how margarita connoisseurs describe Coyote Gold All Natural Pineapple Coconut Margarita. Handcrafted for those who enjoy a fruity tropical refreshment, it’s perfect for the pool, patio or anytime! The Coyote Gold All Natural Pineapple Coconut Margarita was prompted by actual requests from loyal Coyote Gold lovers and experienced beach bums. So we blended premium blue-agave tequila and juicy pineapple with a splash of coconut essence; and after “extensive” experimentation (er…poolside taste testing), a perfect and most delicious combination was born. Its tropical aroma and island-inspired taste transport your soul to the beach; to sun-drenched sensations of sand, surf, and warm ocean breezes! 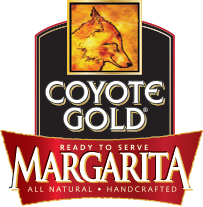 The Coyote Gold All Natural Pineapple Coconut Margarita is available in 1.75L bottles. Ask for it at your favorite liquor store.